Sometimes our dogs develop fears or aversions to things that seem benign. 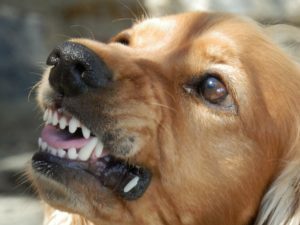 After all, your average dog isn’t really a threat to a dog-reactive dog, so why do they react so strongly? 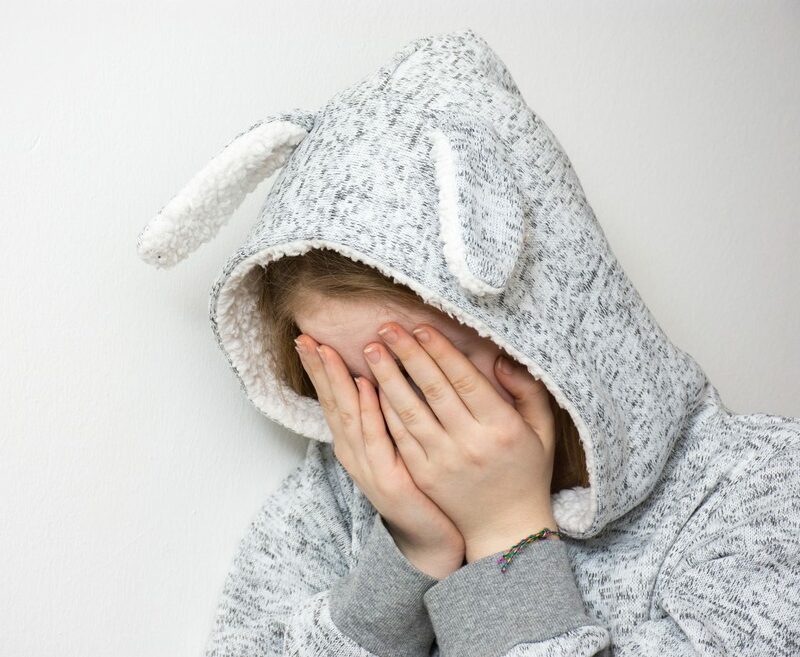 It’s likely due to a number of different factors such as genetics, ontogenetic events, poor socialisation and past trauma. Considering the fact that these triggers don’t pose an actual threat, there is a temptation to just expose our dogs to these stimuli and let them “get over it”. After all, if nothing bad happens, that should teach our dogs not to be worried, right? Right? Exposing our dogs to the things that frighten them, at a level that frightens them, is called flooding. Many TV personalities make a show of flooding dogs and showing (cleverly edited) footage of the dog not reacting to a stimulus. The problem with this is you’re throwing the dog in a situation they can’t escape, which can result in one of two bad consequences. 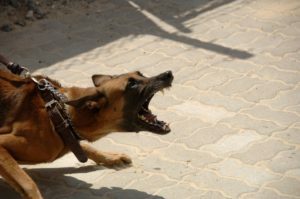 One, the dog may show signs of extreme reactivity or aggression in its desperation to escape (which could result in your own injury). Two the dog will totally shut down to its environment (learned helplessness). Either way, your dog’s emotions aren’t changing for the better and you’re making yourself less trustworthy to your dog in the process. All in all: that’s piss poor dogmanship. Just because you know that something won’t physically harm your dog, that doesn’t mean your dog knows that. In fact, it’s highly likely that your dog will be harmed from the experience EMOTIONALLY. It’s the same for human phobias. Just because a phobia may seem irrational, doesn’t mean it’s easy to overcome. I know from personal experience. 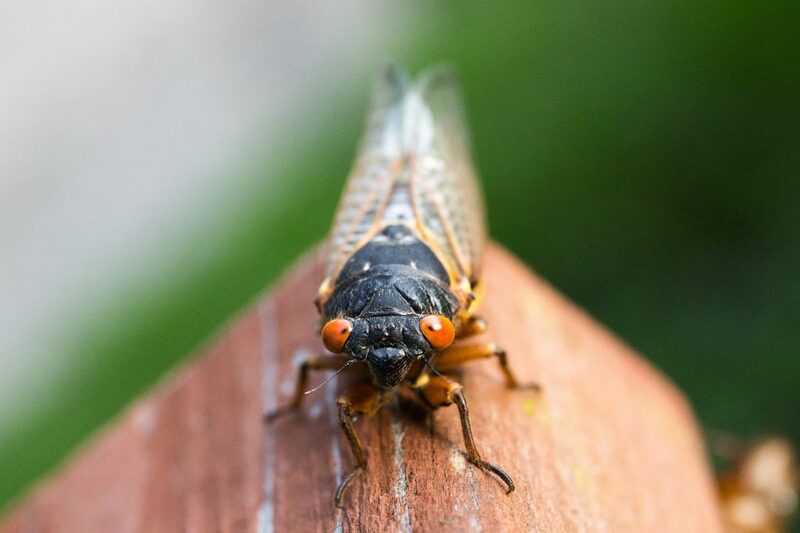 As a child I was deathly afraid of cicadas. Whether it was the idea of them tangling in my (very long) hair, or the fact that they vibrated so hard when caught- I didn’t want a bar of them. I knew cicadas weren’t dangerous and I knew (logically) that they couldn’t harm me. It didn’t stop the fear. Some members of my family took it upon themselves to ‘cure’ me of this phobia. So one night when I was lying in my bedroom, they threw a cicada in and held the door so I couldn’t escape. They flooded me with the stimulus. I threw myself at the door in my desperation to escape. Eventually, after some consistent screaming, banging and crying, one family member took pity on me and let me out. I refused to return to the room for the remainder of the night. Was I cured? Absolutely not! I learned from that experience that I couldn’t trust my family and was more vigilant in case anyone tried any more ‘remedies’ (they did- it never helped). So, if your dog is exhibiting signs of anxiety or fear towards a stimulus, even if it seems totally crazy- respect it. Help them overcome it using methods such as desensitisation/counter conditioning, ideally supervised by a professional at first. Most importantly, tackle this issue WITH your dog as a united front. You’ll experience more success and a stronger bond with your dog if you cultivate trust as opposed to a ‘I know what’s best’ approach. Friend: I’m not really interested in having to do a lot of training and the dog would only be able to get about a half hour walk a day. Friend: Ugh, no! I don’t want one of those annoying yap yap dogs. And this is the point where I sigh and nod politely while the person goes into length about how they would prefer a Siberian Husky even though their care commitments would be better suited to a Chihuahua. 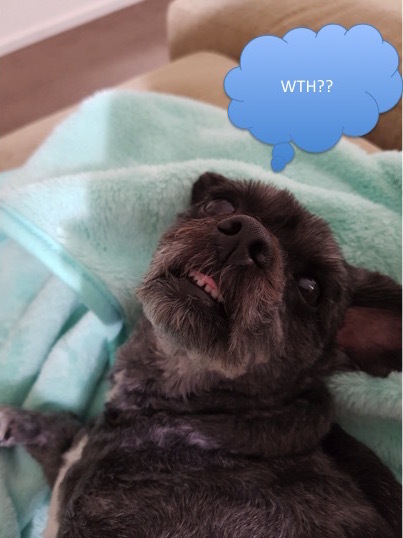 The perspective that little dogs are somehow “not real dogs”, “rats” and “yap yaps” is all too common and needs to end. 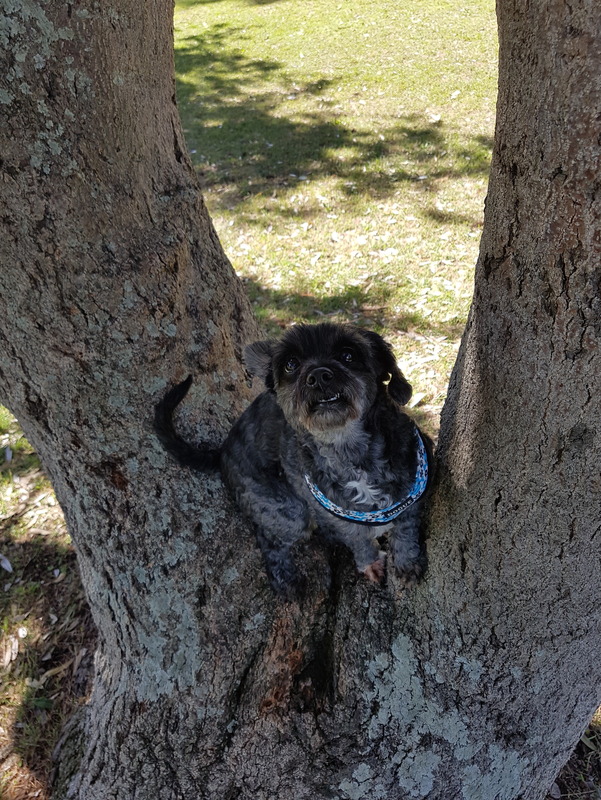 So I want to dispel a few myths about little dogs and highlight some of the great things these little creatures bring to the table. 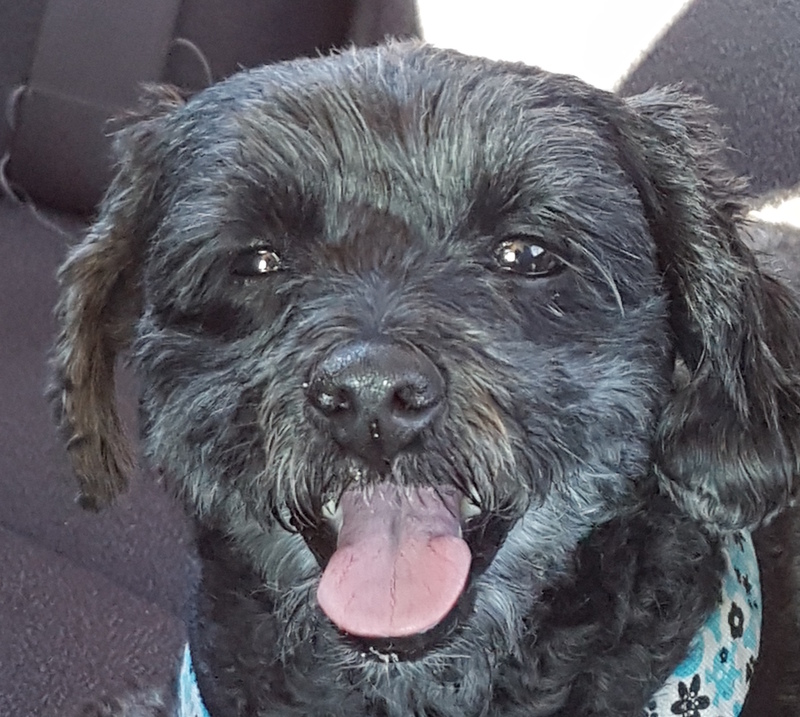 This one is ludicrous considering the Lhasa Apso (of which Halo is half) is considered to be one of the most ancient breeds, with origins dating back more than 4,000 years. To put this into perspective, the German Shepherd Dog dates back to the 1850’s. 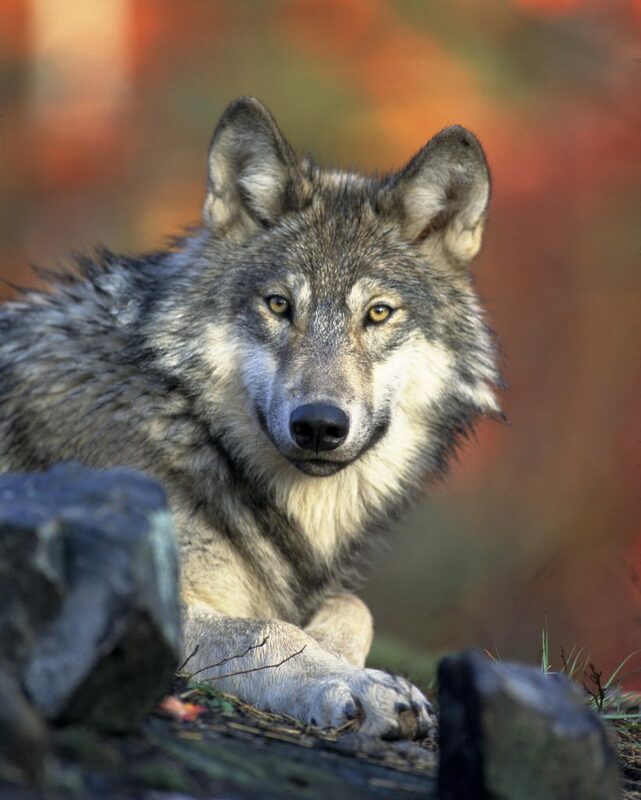 So, Halo could be more closely related to the ancestral wolf than your average German Shepherd Dog. Something to think about. While more owners tend to report small dogs as being less obedient, this is more so a reflection of selection bias than anything else. 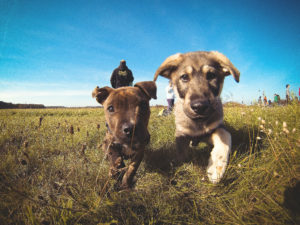 The linked study found that owners of smaller dogs reported to engage in shared activities, exercise and training a lot less than the owners of larger dogs. As such, the ‘yap yaps’ are a product of poor dogmanship, not an intrinsic characteristic of small dogs themselves. 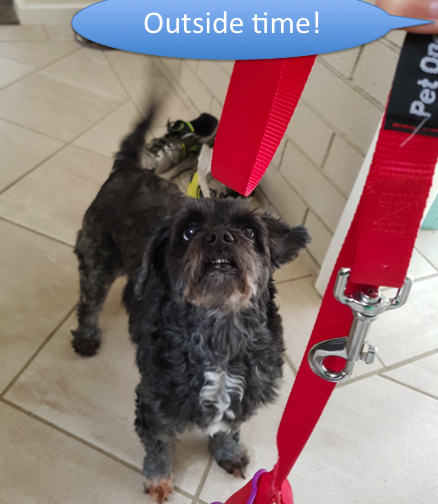 If you prefer snuggling on a couch compared to running 5-10km every morning and participating in canine agility, then a small toy breed is for you! After a short walk and a couple of minutes of trick training, a lot of toy breeds are content to be couch potatoes. An important thing to note here is lower requirements does not mean none, these dogs still need dogmanship to help them thrive. While I’m not advocating using your dog as a handbag accessory, there certainly is some benefit to being able to get your dog out of danger fast. It also means that their, ahem, leavings are likewise easier to dispose of. 3. They’re so damn cute! While this perspective isn’t necessarily scientific, there is something to be said for the immediate surge of dopamine that look at and interacting with a dog can provide. 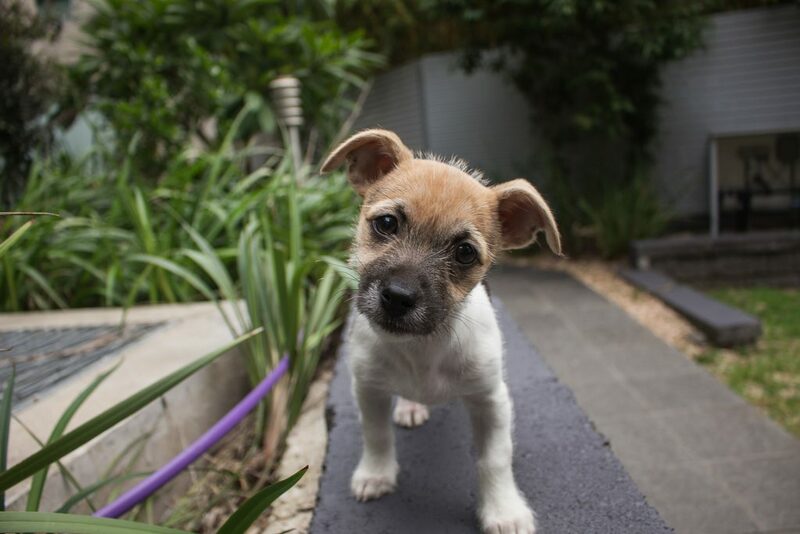 Little dogs are often a lot easier to keep inside, so this maximises your oxytocin and dopamine doses. Who can argue with that!? Consistency is one of the most important things to consider when you interact with your dog. A person who behaves consistently is more predictable! Predictability lets a dog reliably know how to react to a given stimulus (e.g. your behaviour or a particular event). So if something consistently predicts something great (such as a “Yes!” before a treat arrives), you dog will become happy when the predictive stimulus occurs. As a general rule of thumb: Precede all interactions with your dog with some sort of sign that indicates what you’re about to do e.g. saying “do you want to go for a walk?” before you grab a dog’s leash. You’ll likely notice your dog is more calm throughout the day as a result. 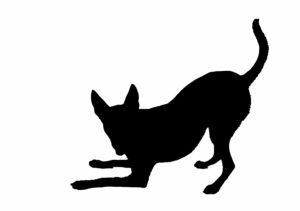 If something not so fun is about to happen, signalling it beforehand can help a dog prepare itself. If you give the same signal before you intend to do something that will change a dog’s environment or situation e.g. saying “be back soon” before leaving, the dog will have a good idea of what’s in store and can behave accordingly. Of course, if you precede these semi-stressful events with a positive experience (e.g. a yummy frozen treat or food puzzle), the dog will soon learn that the previously stressful event now signals good things – so crisis averted! If you train a dog with consistent signals and responses = great obedience performance. When you’re training a dog, pick whichever command you want to use and stick to it. It’s fine to have things change in the learning process (e.g. 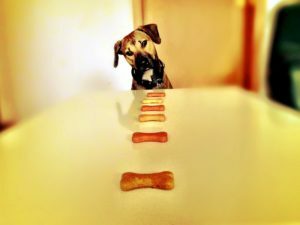 using a treat to lure a behaviour when you first train it), but once you start asking for the same behaviour 3 different ways, you’re going to have once confused dog on your hands. And a final note: Consistency does not mean a lack of variety. A dog should experience a variety of different environments and events throughout its life. 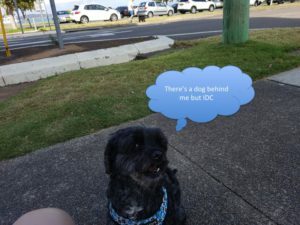 So varying things like outing locations and training environments are great for preparing your dog to be comfortable in all situations at all times. It’s more important to be consistent in your behaviour during these times, so the dog knows how to respond to things that may be a bit different to what he/she is normally used to. Dogs are amazing. We all know this. There’s nothing more exciting than adding a new companion to your family. Having said this, picking a dog to suit your lifestyle can be an arduous experience. While the right dog can enhance your life, mismatches can cause all sorts of problems and (in the saddest of cases) result in relinquishment and/or euthanasia. With this in mind let’s cover some of the main things to think about when you decide you’re ready for a dog. Should I get a dog at all? Sometimes all the passion in the world isn’t enough to be a good dog owner if your lifestyle isn’t conducive. If your dog would be left alone for hours on end and you don’t have the time to dedicate to regular exercise and training, a dog probably isn’t for you. But don’t panic! 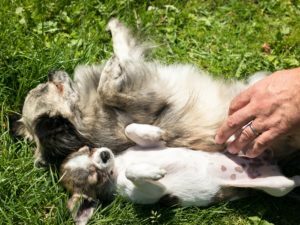 There’s plenty of ways to get a doggy ‘fix’ without the huge responsibility that comes with dog ownership. Look into local rescue groups and get out there to volunteer. You could temporaily foster a dog, walk foster dogs and participate in associated events. My partner and I recently participated in a pack run with Rescue Your Fitness and Hunter Animal Rescue. 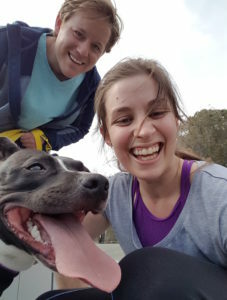 It was a lot of fun walking with Lucy and sharing her story on social media. Thanks to our efforts that darling girl found a home, so it’s definitely worth looking into! People on both sides of the breeder vs rescue debate can get quite heated on this topic. 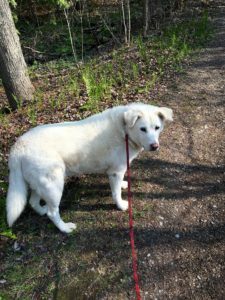 I’m a bit biased in this regard as I tend to recommend rescuing as I know that there are plenty of dogs out there who are desperately in need of a good home. I also think that the average mutt or cross breed is well suited to most potential dog owners, and unless you have incredibly specific requirements from your dog, breed doesn’t totally matter. Having said that, if your needs are specific then by all means seek out a dog breeder. 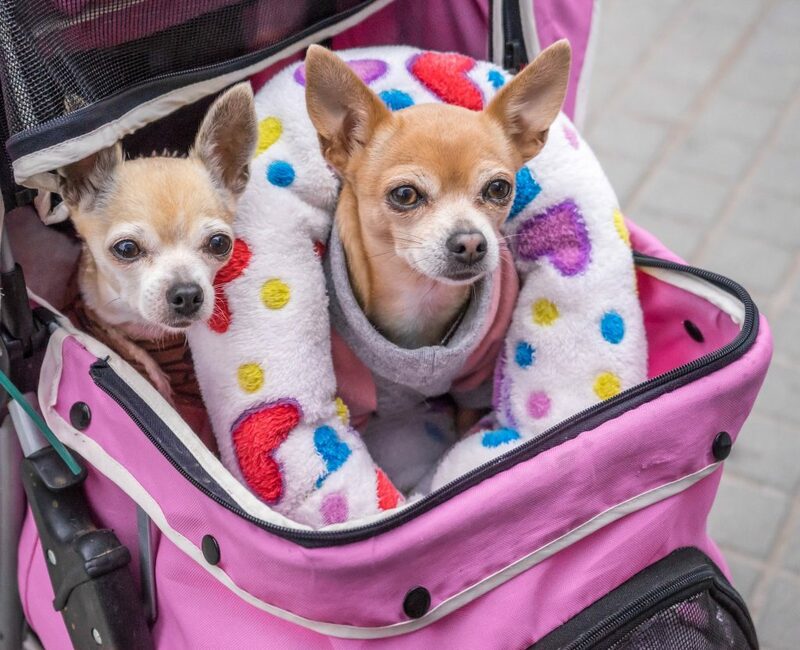 Use a thorough screening process of breeders to ensure you aren’t inadvertently supporting a ‘back yard breeder’ (someone who breeds dogs with no thought or care to their health or welfare). If you’re buying a puppy, make sure the breeder lets you meet both parents and they provide you with health records and vet checks. Most people have the belief that if you’re getting a new dog it HAS to be a puppy. Let me go on the record as saying this is absolutely not true! Getting an adult dog can save you the hassle of teaching basic manners, setting a nice socialisation foundation and toilet training. 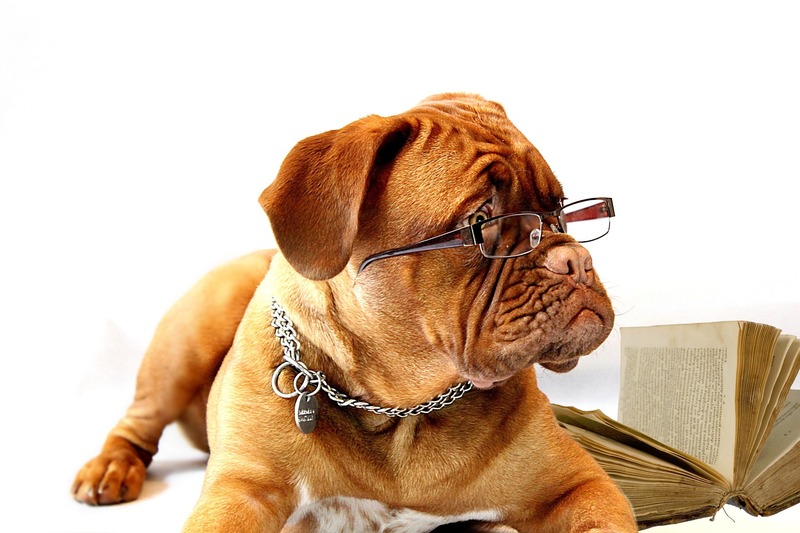 Additionally, although most people believe that they have to train a dog from puppyhood, it’s pretty easy to teach an old dog new tricks. Of course getting a well-mannered adult dog isn’t always a guarantee but it’s worth thinking about. As for breed, I’m adamant that most households would do fine with any old mutt or crossbreed. Having said that, it is important to consider what kind of dog is suited to your household and lifestyle. Think about how much time you would be willing to train, exercise, groom and mentally stimulate your dog and choose accordingly. 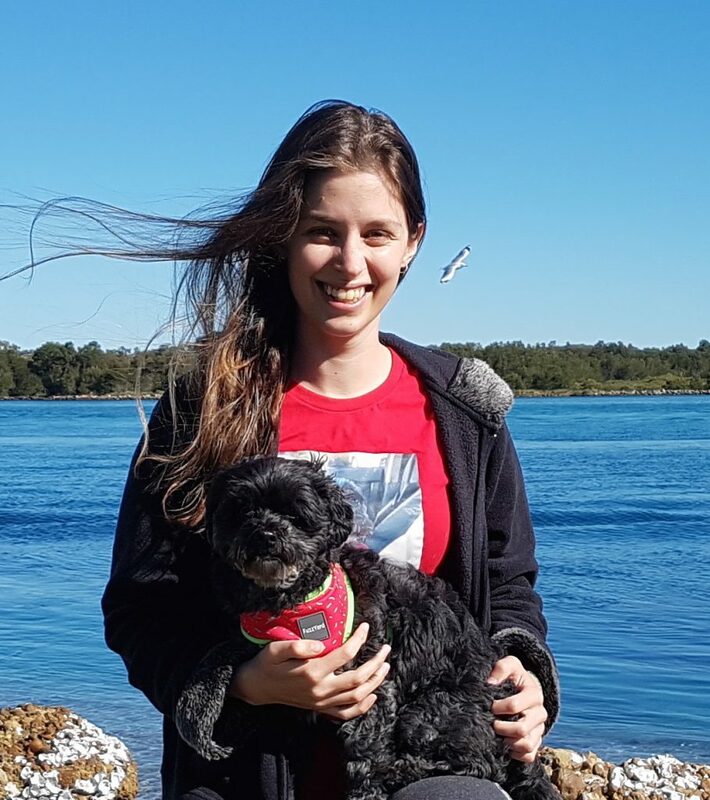 Want a dog with a perfect recall and low exercise maintenance in central Aus? Then a Siberian Husky is probably not for you! Match your needs with what you can give and you should get a general idea for the type of breeds/mixes that would suit you. Play is a behaviour that helps reduce stress in many different species- including dogs and humans. In fact, fearfulness and playfulness are mutually exclusive emotional states. 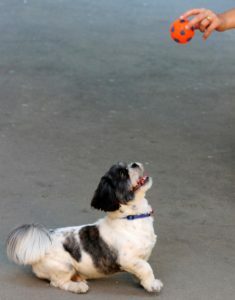 As such, playing with your dog offers the opportunity to remove stress and fearfulness as well as strengthen your bond. Dogs both play with each other and us. However, a dog’s motivation to play with its owner is not affected by play sessions with other dogs. This is likely because, dog-dog play and dog-human play are usually quite different, thus satisfy different needs. Dog-dog play features a lot of body contact and is quite noisy. Typically play sessions will involve some degree of chasing and/or wrestling. 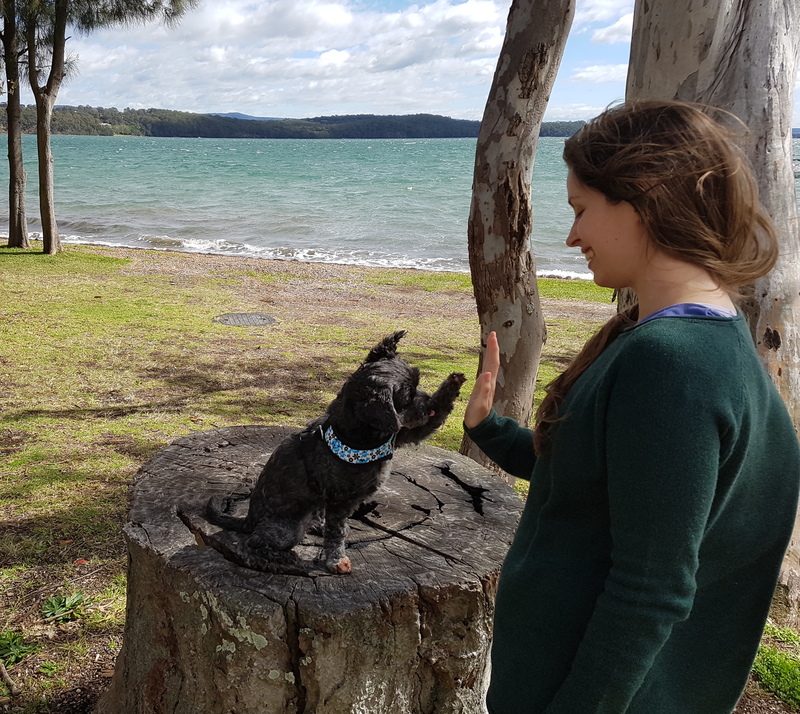 In healthy play bouts, you will see a lot of behavioural signalling from each participant and dogs will adjust their styles/roles based on this feedback. Despite this, there are some dogs who get so carried away with the idea of playing that they will chase/wrestle regardless of the other dog’s say in the matter! These boisterous dogs are so determined to get their play ‘fix’ that they may terrorise their play partners (who are often smaller). 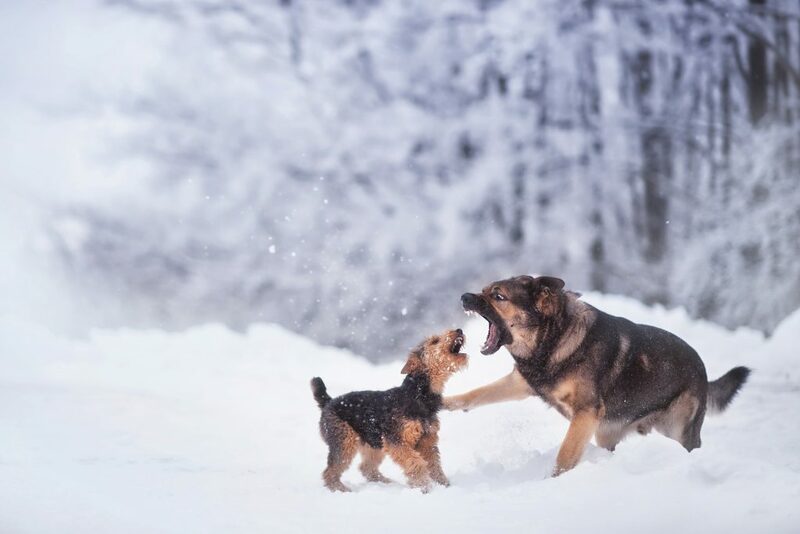 Situations like this is how dog-dog reactivity is borne, so if you see your dog playing with another dog and either member is looking like they have had enough- use that well honed recall and end the session! Dog-human interactions tend to have more of a ‘language barrier’ compared to dog-dog play. As a result, you don’t see the same range of behaviours and role reversals that you would between two dogs. This can cause some trouble with each member sometimes unable to communicate that they want or do not want to play with their partner. Consequently, it can be difficult to know how to play with our dogs effectively and safely. I’ll detail some useful tips below. When dogs want to invite play, they will typically move into what is known as a ‘play bow’ (see picture above). This gives you a reliable indicator that your dog is keen to play. We can also mimic the play bow relatively easily. Don’t worry you don’t have to get in the exact same position to do it (although it’s a great stretch for your chest and shoulders 😉 ), simply bend your knees and do a mini jump. This way you can politely invite your dog to play with you. Although play is GREAT for stress reduction, it’s also quite exciting and can lead to over arousal. An over aroused dog can get in all sorts of trouble from mouthing, destruction and clawing. 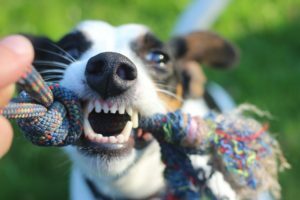 As a general rule, don’t start a play session with your dog if they are already over aroused (jumping up, mouthing and other excessive behaviours are a good sign of this). It’s also good to have a cue (command) that signals to your dog that the play session is over. To teach this, simply give the signal (e.g. “Enough!”), immediately stop playing with your dog and walk away with your hands by your sides. If you like you can also give your dog a treat for disengaging from the session. Do not resume playing with your dog until he has completed calmed down. 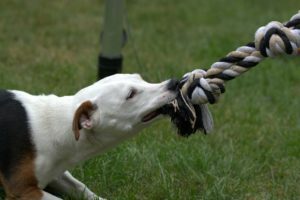 Each dog has his or her own particular play preferences. Some like chasing while others prefer fetch. Some dogs are always up for play, others only like to play in the mornings (… this is starting to sound like a euphemism :\ ). Learn your dog’s preferences and don’t try to coerce them into playing when they aren’t keen (i.e. the don’t respond to your play bow). Take a break and try something else at a different time. There’s plenty of games out there (e.g. hide and seek, nose work games, targeting games, chasing etc etc), if one doesn’t work, try another. The most important thing is that you both are having FUN. 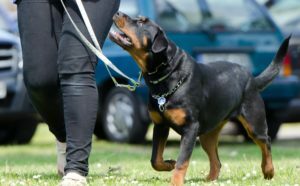 There’s one crucial behaviour that EVERY dog owner needs to teach their dog to do reliably. 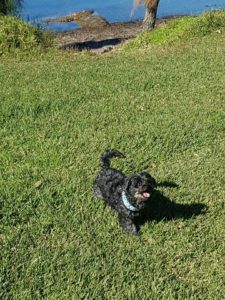 It is especially essential if you want to take your dog to off leash areas and have an enjoyable, stress-free experience. What behaviour could I be talking about? 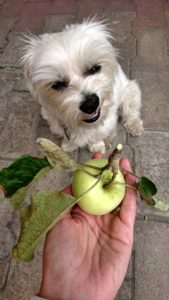 Now while having a pint-sized Robin Hood might be high on your priority list (see a future post about getting your dog to pick up objects on cue), there’s another behaviour that’s probably more important. Getting your dog to respond to his name and come to you when called is an important foundation behaviour that every dog should learn. 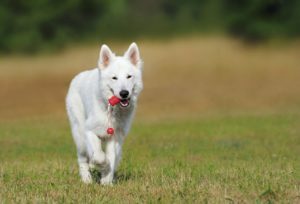 It can be used to keep all off leash experiences controlled and, most importantly, get your dog out of dangerous situations. 1. 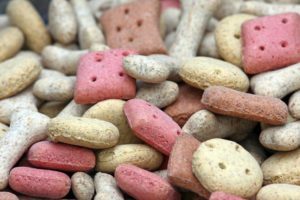 Have something valuable to your dog on hand (such as tasty treats or a favourite toy. 2. (At first) Make sure your dog can see that you have the thing of value e.g. holding object in plain view, crinkling a treat bag etc. 3. Excitedly call your dog’s name (crouching down and holding your arms out also helps). 4. When your dog comes right up to you (i.e. within arms reach), give him/her the reward. Sound simple? Most dog owners get the foundations of recall just fine, but run into problems down the line. 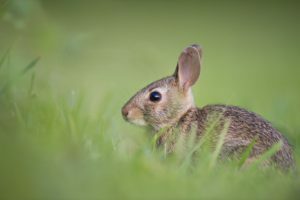 I’ve detailed some examples of common recall issues and ways to work through them. This usually happens when training sessions are ritualised (i.e. predictable) and your dog can easily anticipate whether listening to you will ‘pay off’ or not. Try to mix up your routine a bit and make training sessions more random. Stash away little containers of treats around the house and practice and practice randomly calling your dog to you. You might also try occasionally carrying treats in your pocket (fill your pockets when your dog is out of the room). 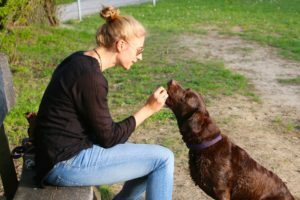 Once your dog is responding to you under these conditions, you can start to only give treats sometimes (intermittent reinforcement). If there’s a chance for food, most dogs will still gamble. It’s also a good idea to precede each treat with some verbal praise. This way, on the occasions where you don’t deliver a treat, praise alone can make you dog feel good regardless (because of the positive association between praise and nice things happening). It’s pretty common for most/all dog keeping duties to be allocated to one member of a household. This may be fine most of the time, but can be extremely frustrating in situations where another family member has to interact with the dog. To rectify this all family members should interact with the dog- especially recall practice. A great strategy is to have each family member (armed with treats) spread out and practice calling the dog to them. Once the dog seems to get it, increase the distance between everyone (e.g. from standing apart in one room to calling the dog across different rooms). Continue to increase the difficulty (practising in different environments with increasing levels of distractions) until your dog can reliably return to each family member. If a dog is only familiar with performing a behaviour (like recall) in a particular set of circumstances (e.g. indoors with you blatantly holding treats in your hands), she may not be able to generalise this behaviour to a totally new context. As such, it’s a tall order to expect a dog who has only had experience training indoors, to have excellent recall outside of the house- particularly when there’s plenty of exciting stuff around. As with issue 1, mix up your training sessions a bit to improve your dog’s responsiveness in a variety of contexts (e.g. different rooms in the house, in the backyard, out on walks, near noisy children, near other dogs, etc etc). Avoid letting your dog off leash if you’re not confident that he will come back to you. Grab a long line (or make one) and practice calling your dog to you in outdoor environments with increasing amounts of distractions nearby. Avoid yanking your dog towards you- you want calling your dog to be a 100% positive experience. Most importantly, keep practising. Recall is absolutely necessary for every dog owner. In situations where your dog escapes or gets accidentally let out the front, it can be a lifesaver. Also, I wouldn’t have been able to afford my morning chai lattes without Halo’s recall ;). 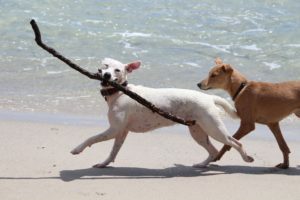 Having a dog can be a great experience filled with shared activities that are fun and enriching for you and your dog. Unfortunately, some of us don’t always get to reap these benefits. If this is something that you experience on a regular basis, chances are you have a reactive dog. 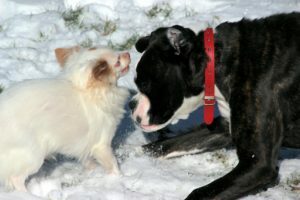 In the world of dog behaviour, reactivity means an inappropriate behavioural reaction to an external event or stimulus. The behaviour itself might be normal but the context and/or the intensity of the behaviour is not. 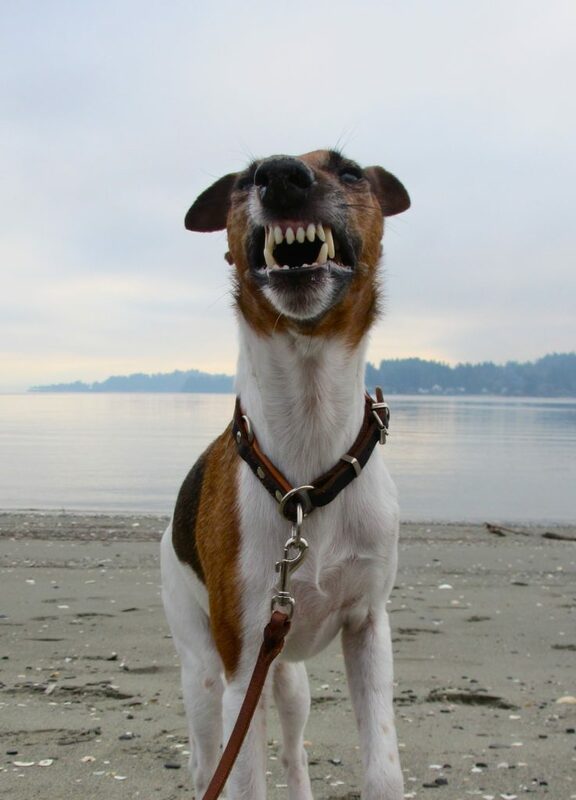 A dog that lunges, snarls and or snaps at a passing dog is showing signs of dog reactivity (this behaviour may or may not occur exclusively on lead). A dog may also show signs of hyper vigilance, wariness and extreme excitability around things that are loud and unpredictable (like children!). These behaviours can worsen and develop into more proactive dangerous behaviours (active aggression). Is there a cure for reactivity? But don’t panic! 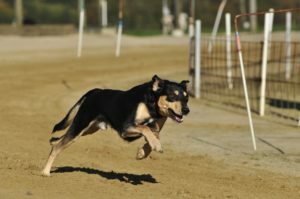 There are several things you can do to manage your dog’s reactions and increase their tolerance to triggering events. Your dog reactive dog may never feel comfortable doing a nose-to-nose greeting on a footpath (note: Halo sure isn’t! ), but you can certainly give them the tools to face things like passing other dogs calmly. There’s a whole ranging of coping skills you can teach your dog and tools you can use. The ultimate success of these strategies will depend in part on your dog’s reactivity type, his/her personality and your own dogmanship. Some people may experience success with one method, others might require a combination approach. The key message is to never give up and do what’s best for you and your dog. Obviously I can’t hash out everything in a single blog post but I’ll summarise a few basics below. Look out for more reactivity strategies in future blog posts! 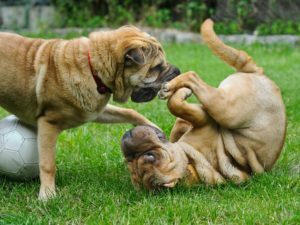 If your dog is reactive, the first thing you need to do is to figure out the exact circumstances where your dog displays the inappropriate behaviour. 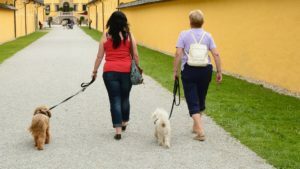 Is it in response to other dogs on leash? Off leash? Big dogs only? People with hats? Write each trigger down and it will give you a better picture of the things that push your dog ‘over threshold’ (the point at which he/she starts to react). Once you know your triggers you can start to manage your dog’s reactivity. Start off by avoiding these triggers as best you can except when you are actively working on management. The best way to manage reactivity is to get your dog to an optimal level of arousal (excitability/energy) and emotional state. You’ll get your best results when your dog is at a low arousal level and positive emotional state (i.e. 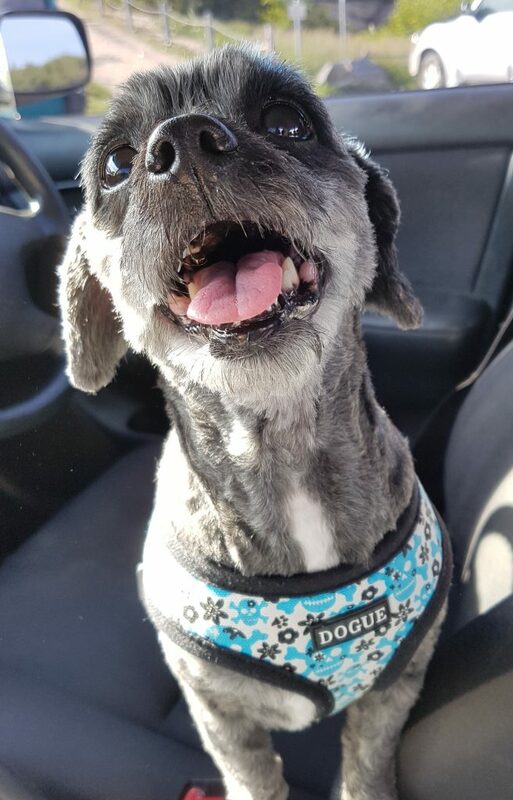 a calm and happy dog). The most commonly advocated way of managing reactivity is through counter conditioning and desensitisation. 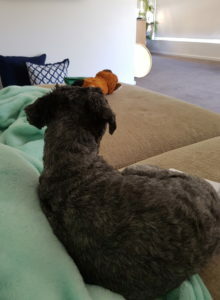 Counter conditioning is working on switching a dog’s emotional associations with its triggers (from ‘bad things will happen’ to ‘good things will happen’). This usually involves giving dogs treats in the presence of their triggers. The trick is to introduce the triggering noise/thing at a low enough level that a dog doesn’t react to it (this is termed ‘under threshold’). For Halo, this meant her being 50m or more away from a strange dog on leash. 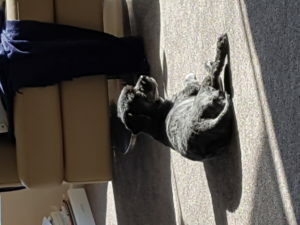 ‘Under threshold’ means the dog is attentive to you and not overtly reacting to the stimulus (dogs that aren’t barking but are extremely tense and won’t pay attention to you are past threshold). Give your dog a delivery of treats (or other reward depending on your dog, some really value play or toys etc) paired with gentle verbal praise (“good boy” etc etc) while the trigger is present. It is important to deliver treats/other things of valuable continuously until the trigger is completely out of sight/earshot (some triggers are auditory). In time, you increase the dog’s exposure (e.g. 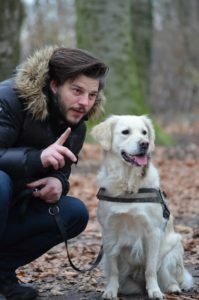 move closer to another dog while on leash while still giving treats and praise) to the triggers and keep rewarding the dog for not reacting. If you move too fast and your dog becomes anxious, reduce the intensity significantly and then work on building it back up. 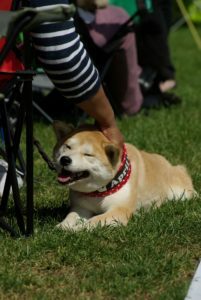 Ideally, you want to maximise the amount of time your dog is calm and happy during these encounters (try to stay happy and calm yourself- it helps!). 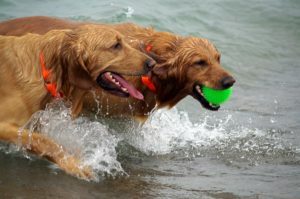 Some people have a tendency to want to get their dogs right next to their trigger on the very first session and are surprised when their dogs get even more stressed. Think of like this: if you developed an intense phobia to water after a shark attack, you wouldn’t want someone throwing you in the open ocean. We get over trauma through gentle and controlled exposures to triggers. 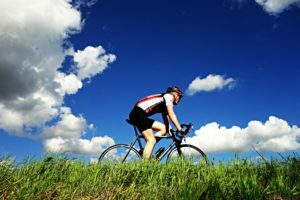 There’s no harm in getting a professional to help start you out on your reactivity management journey. 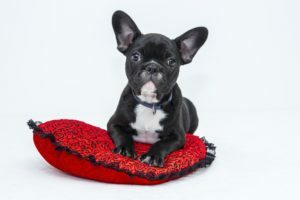 In fact, a professional behaviorist can help you navigate the potential pitfalls that happen to a lot of owners (like exposing your dog to it’s triggers at too high an intensity). If you are at all worried about the safety of you, your dog or others- get help, your dog will thank you for it. Good luck, managing reactivity is tough but it CAN get better, it did for me! Many dogs that develop behavioural issues in their adult lives (such as an aversion to certain floor surfaces, fear of strange men etc) do so because of inadequte socialisation during puppyhood. My own dog’s reactivity towards strange dogs is likely due to insufficient and/or negative interactions with dogs while she was a puppy. So, how do we socialise puppies correctly? I’m comfortable in this scenario, yay! Socialisation at its core is exposing your puppy to the various stimuli/events that it is likely to encounter over the course of its life. The emphasis here should be to ensure that your dog’s experiences with these stimuli are POSITIVE, i.e. good things are associated with them. It’s also important to expose your dog to these things gradually and to allow them to escape and approach things at their own pace. 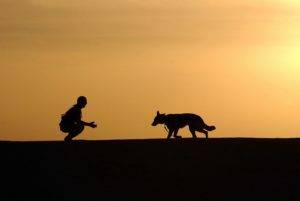 Forcing a dog to approach something it’s afraid of will likely create strong negative associations, which can build to extreme fearfulness and anxiety in adulthood. Your puppy should also be exposed to the same stimuli in new contexts (e.g. meeting new people in the house as well as out on walks) to their confidence in new things can easily generalise. 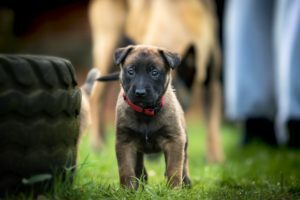 Some examples of key things your puppy should be exposed to are discussed below. Again, these things should be introduced at a low intensity and give the dog an opportunity to avoid or escape if he/she chooses. Exposures should be paired with something of value (such as treats, praise and or stroking) to ensure they are mainly a positive experience. 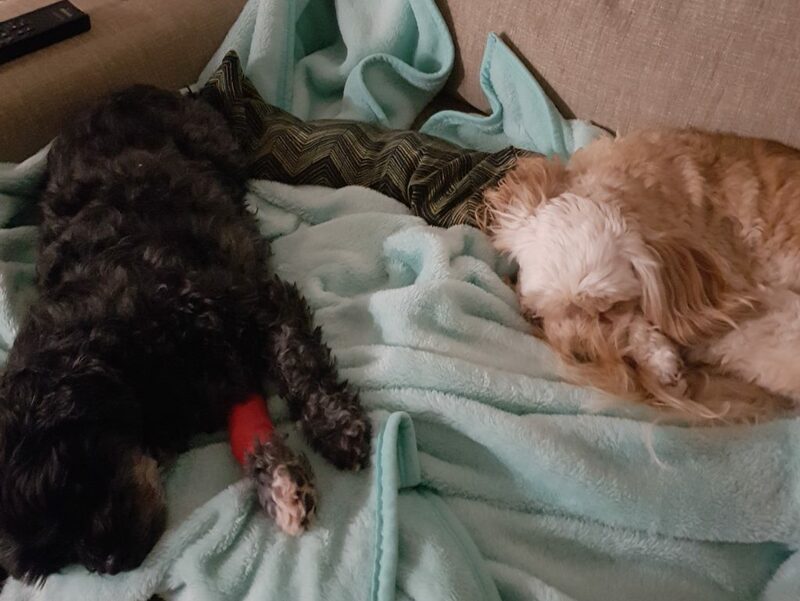 I’ve heard a few stories about dog owners who have moved house and noticed their dogs have a distinct problem with the flooring or stairs in the new house. Helping your puppy to be comfortable on concrete, carpet, tiles etc etc will save you a lot of time and worry in the long run. Also, make sure your puppy is used to walking (and more importantly, toileting) on wet grass. You’ll thank yourself in the rainy season! Gentle early experiences with examination (by you and a stranger) will make things like vet and groomer visits a lot more simple. 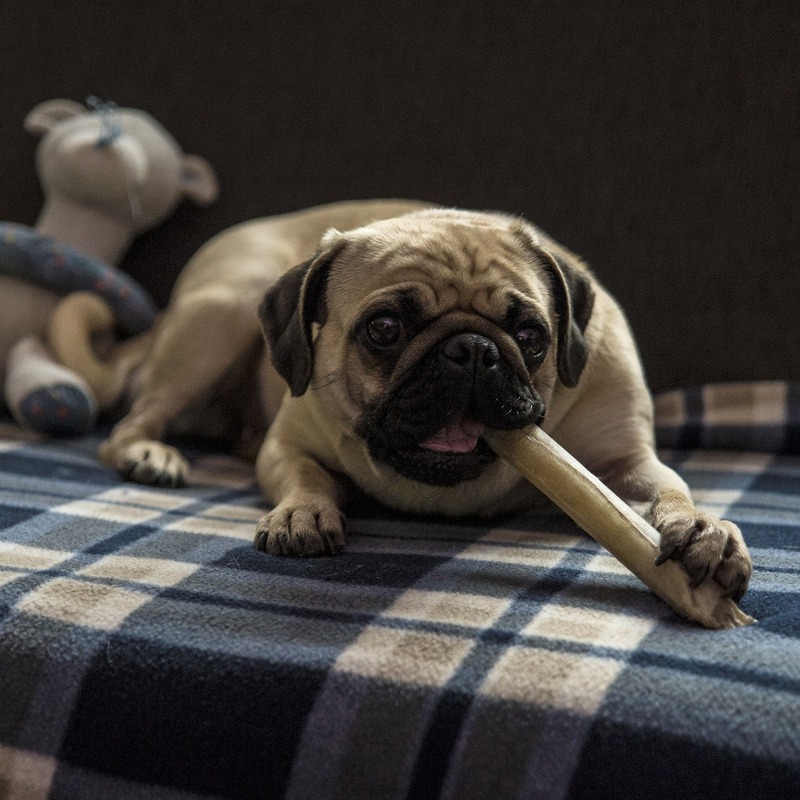 Regularly touching your dog’s mouth/gums, ears, tail and paws (especially when paired with a yummy treat) will decrease your dog’s sensitivity to these areas. We all know that us humans come in all shapes and sizes. However, that might not always be clear to our dogs! Familiarising your dog with people of different ages, sizes and ethinicities is a great way to avoid distrust down the line. Of particular importance is exposure to children. Children can behave quite differently (erratically) than adults and are also physically closer to a dog’s level. Bearing this in mind, it is no surprise that dog attacks on children are so common. 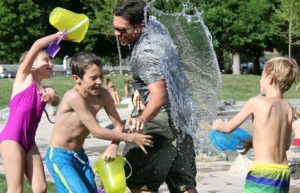 Positive exposure to children (not just the children of the household) can make these little humans more predictable and less likely to induce fear related responses. 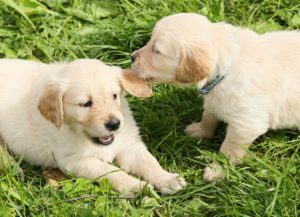 Puppy socialisation classes are offered by most vets are invaluable. They expose your dog to other breeds and temperaments in a controlled environment. 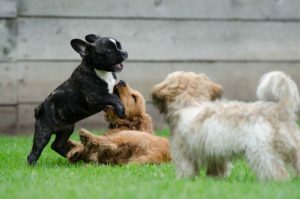 Not only does this do wonders to reduce fear of new dogs, it teaches puppies how to play correctly with other dogs and other essential social behaviours. 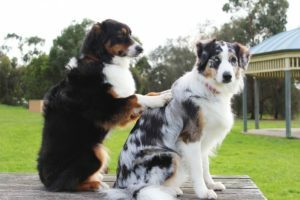 Once they have received their final vaccinations, puppies should also be exposed to (friendly and social) adult dogs, even ones that might tell them to knock it off every once in a while- the ability to recognise and respect another dog’s ‘please leave me alone signal’ is sorely lacking in many adult dogs! Can’t seem to get your dog’s attention? Try this! 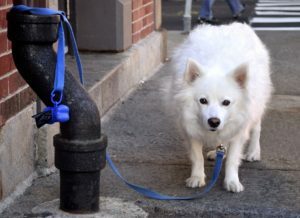 If this is a familiar sight despite your best attempts, then it’s highly likely your dog doesn’t think you are salient. In other words, your dog doesn’t look to you for information and sees no benefit from responding to you. 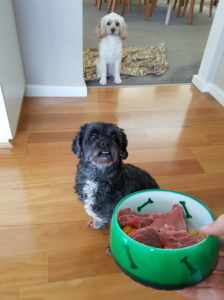 Clearly food is valuable to your dog, so it’s in his/her best interests to know where you are (and by association, the food) come dinner time. So to be able to consistently engage our dog’s attention and be looked at as a source of useful and valuable information to our dogs we must offer something valuable. 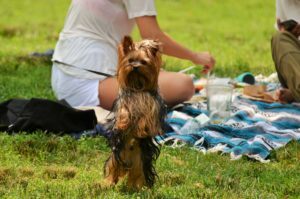 Chances are you already offer your dog plenty of valuable things in a given day such as food, treats, play and exercise. So how can you use those things to get better communication between you and your dog? Make yourself the gateway to all of these things! This strategy of making our interactions with our dogs ‘transactions’ is sometimes called ‘Nothing in life is free’, where basically your dog does not get anything of value until he has earned it in some way. Typically, this just involves having your dog sit before he’s fed, lead attached, allowed to greet guests etc etc. 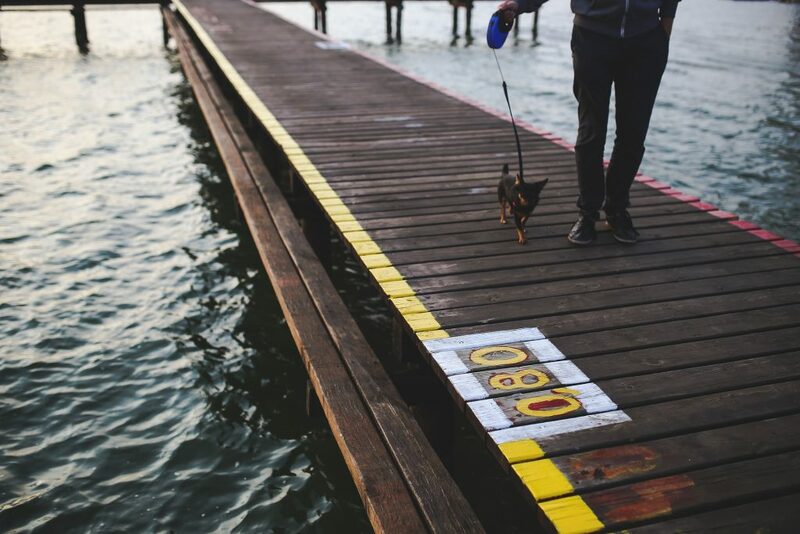 This way your dog knows that you are the key to any and all fun so you become the first port of call. A lot of people struggle to completely transition all their interactions with their dog into transactions of sorts. 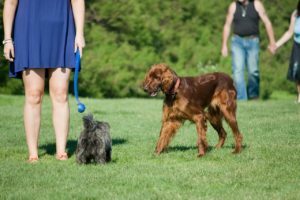 This strategy should NOT be all encompassing and should be used in conjunction with good dogmanship that encourages your dog to be calm and happy. Patting and stroking are used to express our affection towards our friends and it’s often automatic, so these interactions should NOT be transactional. ‘Nothing in life is free’ if applied correctly (i.e. 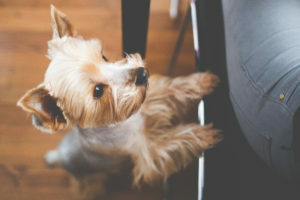 taking your animal’s needs into consideration) should greatly improve your dogmanship by improving your ability to attract your dog’s attention as well as help you to curb some undesirable behaviours (such as jumping up on guests). It’s also a very safe strategy as encouraging your dog to sit before activities such as crossing roads and walking outside. It might save your dog’s life one day 🙂 . Bearing in mind our previous discussion on anthropomorphism, sharing food with your dog can, on occasion, be a pleasant bonding activity. To ensure this is always the case, there are a few key dos and don’ts. There are several foods that both you and your pup can enjoy without causing either of you stomach upset. 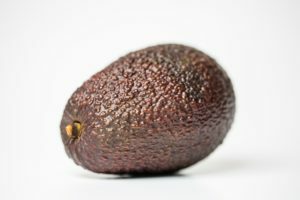 To err on the side of caution, I’d advise on produce as dogs can experience digestive upset from the seasonings and add-ons used to cook meat (seasoning only your portion after cooking is also an option of course). 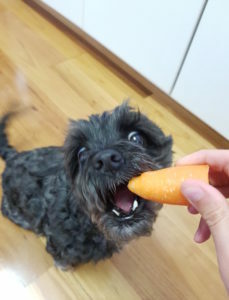 Raw or cooked green beans, peas and carrot (cut up into suitable portions) can be given in small quantities (Halo for some reason LOVES raw carrot). Mashed potato or sweet potato (without any butter or salt) can also be pleasant. In fact, cooked sweet potato and pumpkin can be added to a dog’s diet to increase fibre intake. Here comes that anthropomorphism term again. The amount of people who give their dogs downright toxic foods (like chocolate or strawberry yoghurt) under the misapprehension “If I like it, my dog likes it too!” is staggering sometimes. No brief sugar hit/emotional boost is worth your dog suffering from cramps, diarrhea or nervous shock. Period. 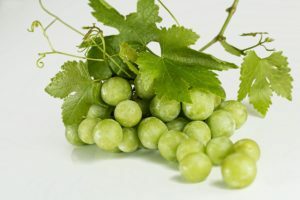 Some notable fruits and vegetables to avoid are: grapes, raisins, onion, garlic and avocado. For many dogs, food is a powerful emotional force. Receiving food stimulates two brain centres, one for pleasure and another for appetitive motivation (wanting). So use your bonding moment to teach something to your dog, even if it is as simple as only giving him/her food when sitting calmly (the above picture is ‘calm’ for Halo anyway). A begging dog can be frustrating and tiring thing to deal with. To avoid the ‘soul gaze’ or similar behaviours at the dinner table, it’s best to only share food in a totally differing context such as chilling in the backyard. You can also use food sharing to teach alternative behaviours to begging. For example, if your dog learns that they receive food when they are at a distance from you and averting their gaze, most will be willing to gamble. Halo is doing it right now. Copyright text 2017 by Dr Elyssa Payne - Canine Behaviour Consultant. ABN 805 700 328 35.